Blackjack, Twenty-One, Vingt-et-Un and many other names are so familiar to us. It seems that each country has its own name for this wonderful game. If you have never heard of blackjack, you probably have watched many films about different casino affairs, tricks, cheating and so on that mentioned blackjack game. There were some folks, who played this game long-long time ago. Unfortunately, none knows how everything started. The game called Twenty-One was a predecessor of blackjack. And only some time later, in the 17th century was the first time, when blackjack was described by Miguel de Cervantes. The game of blackjack is usually related by the experts to Spanish 21 and Pontoon, which are considered as blackjack game variations. This game also includes so many strategies, which really work comparing to the roulette strategies (roulette tips) and slot machine strategies. They may be compares only with poker strategies in their effectiveness. The goal of the game is to reach 21 points as fast as possible and that is how you win the game and beat the dealer. The dealer's goal is to win as well. In blackjack you do not play against other players, every player plays against the dealer but at the same time you do not form a team with other players. 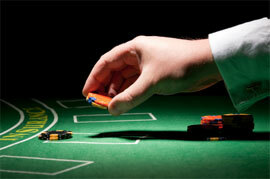 If you want to apply some card counting strategies, you should use them only in a land casino. Why? The reason is that after each round the cards are shuffled and you cannot track the cards in them, although you can always try and see for yourself. Your main aim is to get as closer to 21 as possible and to have more points than the dealer has. Before you receive the cards you place your bets. The players receive their cards face up while the dealer has one card face down. In European casinos the dealer can have only one card while all the players have two cards. Usually the cards are shuffled in a shuffling machine or by a dealer. The game can be played with one and more decks. The casinos usually use two and more decks. Once you received your cards, you decide on the further actions. The cards have point values. All the cards lower than 10 have the point values, which are the same as their numbers. The suits do not matter (as all the suits are equal). All the face cards make 10 points each. Those are Jacks, Queens and Kings. The Ace is a special card, which can be counted both as 11 and 1. The player decides what value it has, which is more beneficial for the player. If the player receives an Ace and a face card, it means that he/she has Blackjack. The payout is 3:2. If the dealer has 21 or the highest points, all bets of the players lose. If the players beat the dealer, their payouts are 2:1. There is one condition. If the player busts (goes over 21 points), he/she loses the bets.